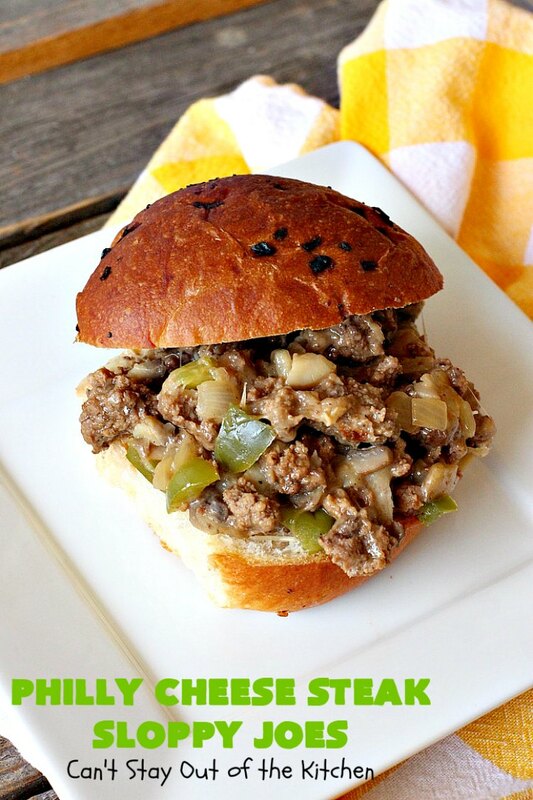 Oh, my, Philly Cheese Steak Sloppy Joes are spectacular. 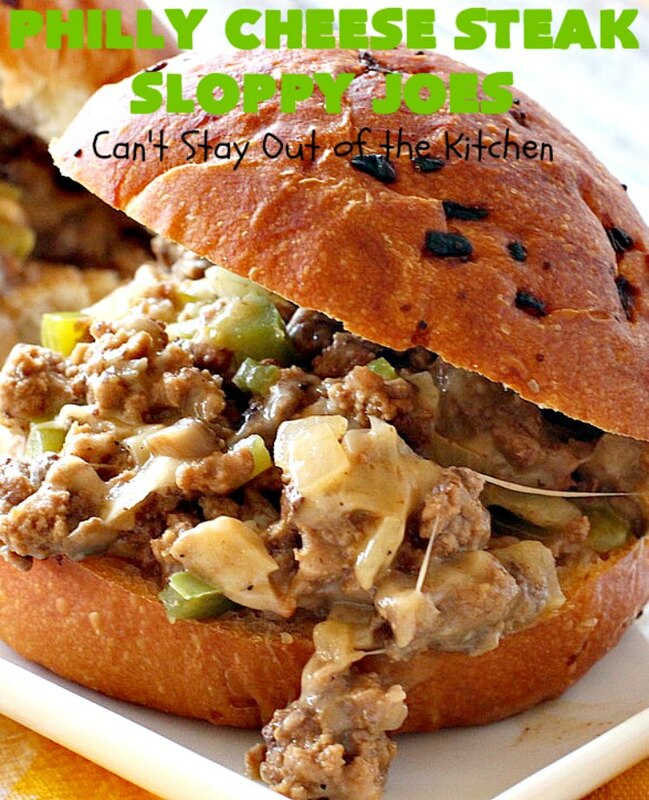 These are some of the best Sloppy Joes you’ll ever eat. 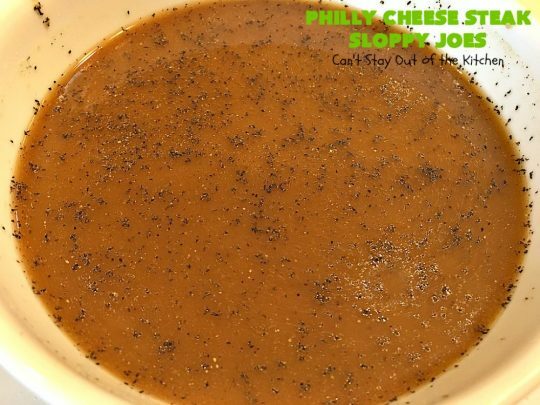 I love the taste, texture and cheesiness of this delightful recipe. These Sloppy Joes are pretty basic with ground beef, green bell peppers, mushrooms, provolone cheese and a beef broth-type sauce. The ingredients are easily available. 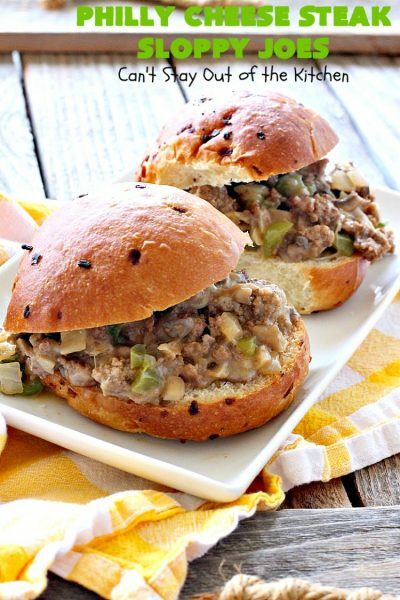 They are really tasty served on ciabatta buns, onion rolls or specialty buns, but you can also use plain hamburger buns if that’s all you have on hand. Plus, you can have this recipe ready for dinner in about 15 minutes! Yes, that’s right. You’re eyes were not deceiving you. 15 minutes! What’s not to love about a tasty dinner entree that’s great for days when you’re short on time? If you find yourself playing taxi driver and shuttling kids back and forth to ball games, music, ballet or gymnastics lessons, this is a terrific recipe to make. 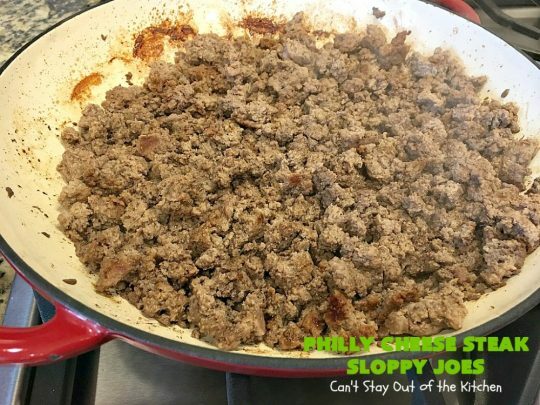 Back in February I served these delicious Sloppy Joes for our Friday night care group. They were a huge hit with everyone. So, since I made two batches, I froze the remainder and then reheated it in the crockpot the following week. I was making and organizing meals for our youth Disciple Now Weekend at our church and I served these along with my regular Sloppy Joes for a host home with 10th grade boys. I got a text back from our friends who were hosting that they guys loved the Sloppy Joes and Toasted Coconut White Chocolate Chip Cookies I made. For those of you who are gluten intolerant, this recipe can remain gluten free if you use gluten free rolls to serve it in. You can also skip the bun entirely if you desire. But they were are tasty on a bulky roll like brioche, ciabatta or onion rolls. 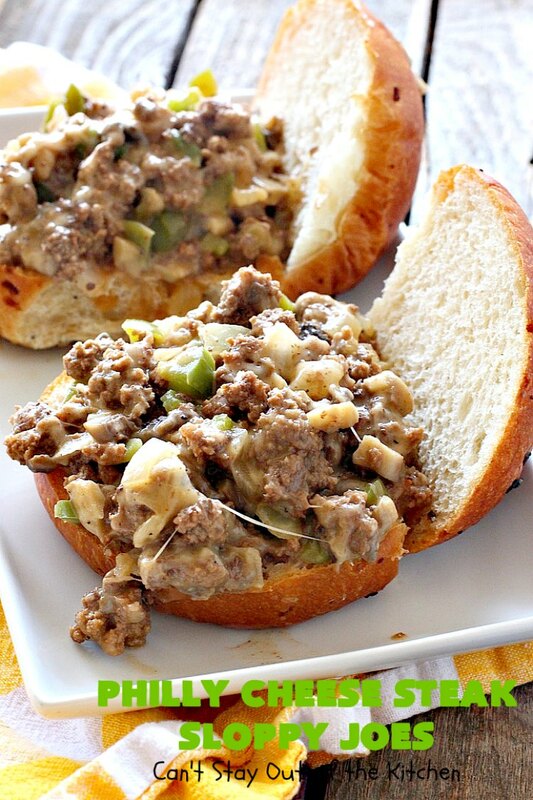 Philly Cheese Steak Sloppy Joes are ooey, gooey and delicious. If you enjoy the flavors of Philly Cheesesteak Sliders or sub sandwiches, then you’ll love this Sloppy Joe version, too. These sandwiches are mouthwatering and so delicious. They’re really terrific for company, easy kid-friendly meals or parties, or when you want a tasty meal without a lot of fuss. Give them a try. But don’t say I didn’t warn you. 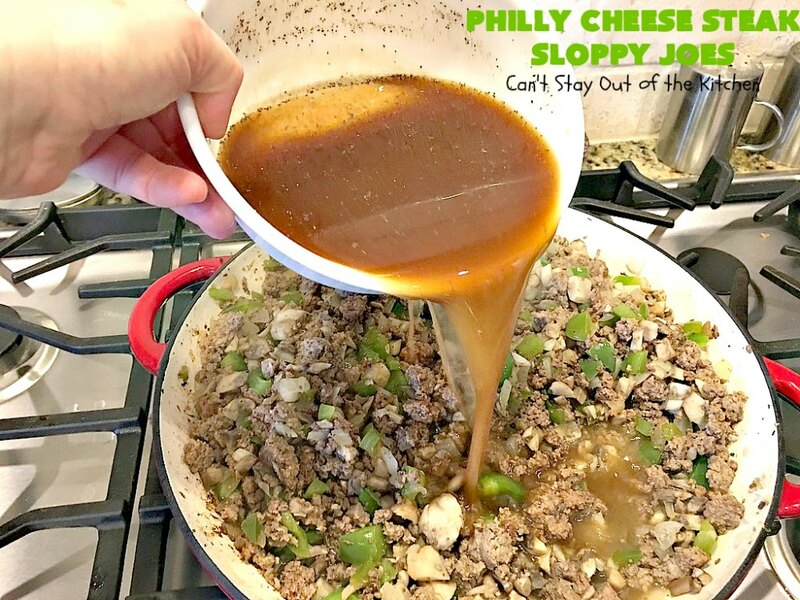 Philly Cheese Steak Sloppy Joes are addictive. You’ll want more than one! Philly Cheese Steak Sloppy Joes are spectacular. These kid-friendly sandwiches are great for parties when you have a lot of kids. 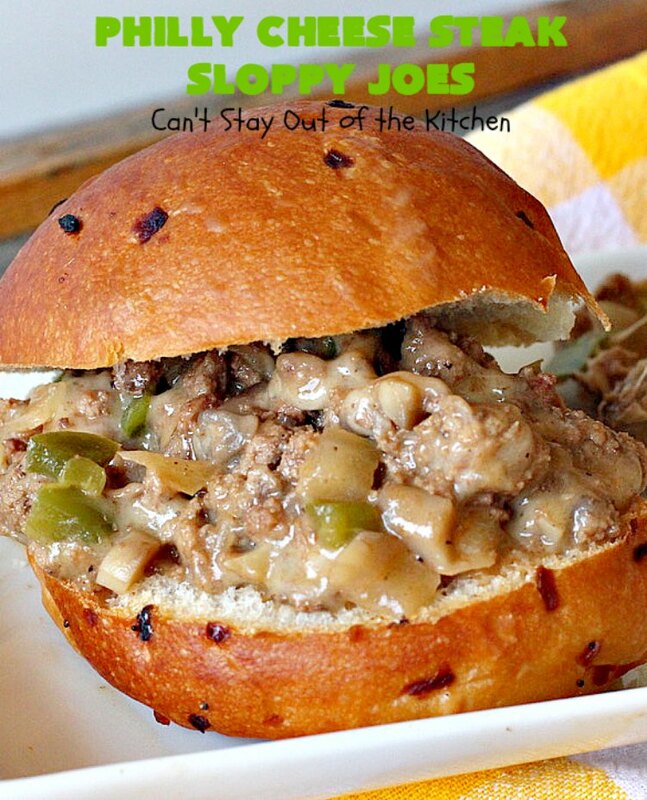 They love this version of Sloppy Joes. 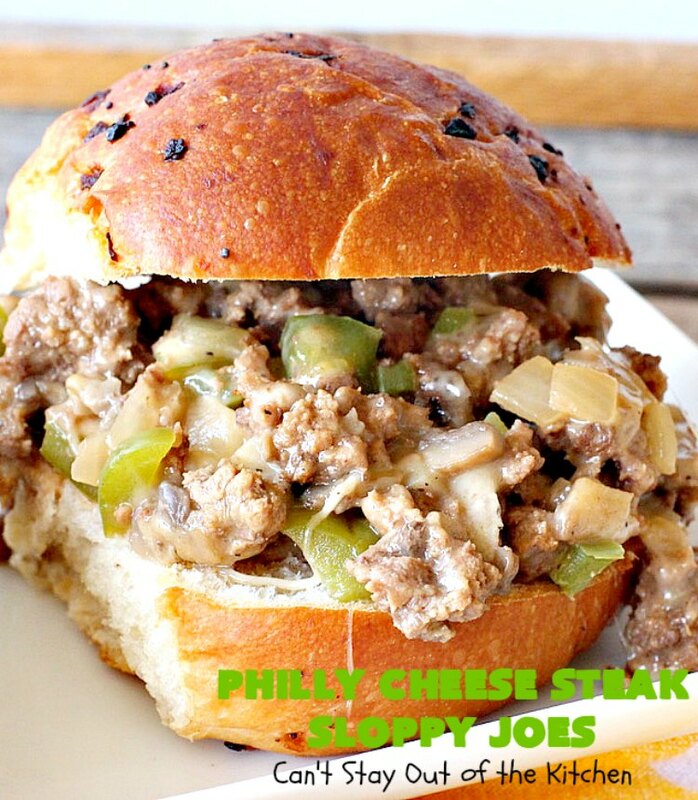 I packed the meat on these Philly Cheese Steak Sloppy Joes. Because they have so much provolone cheese, they’re nice and cheesy too. Move beef to the side of the skillet. Add butter, onions and green bell peppers. Saute about 5 minutes or as long as it takes the mushrooms to soften. Add sauce ingredients to ingredients in skillet and cook about 5 minutes until liquid absorbs. 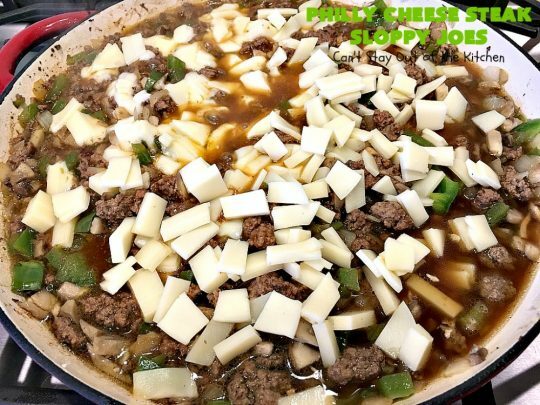 Add provolone cheese and stir until cheese melts. Serve hot sloppy joes over top of ciabatta buns, onion rolls or hamburger buns. Every bite of Philly Cheese Steak Sloppy Joes will have you drooling! These sandwiches are great to make for weeknight suppers when you’re short on time. 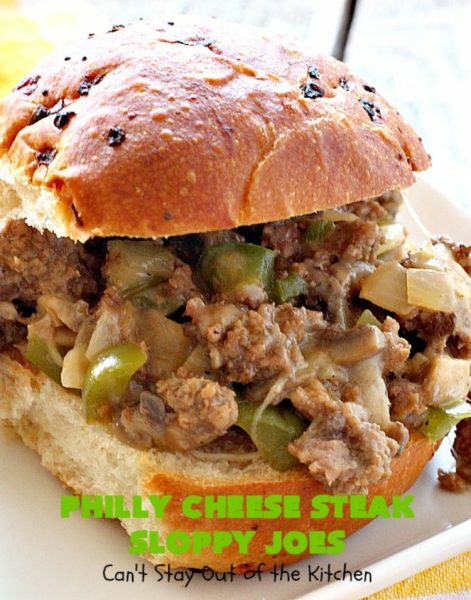 The provolone cheese makes these sandwiches, ooey, gooey and delicious! I froze the ingredients and then reheated in the crockpot a week later. The Sloppy Joes were still fantastic. 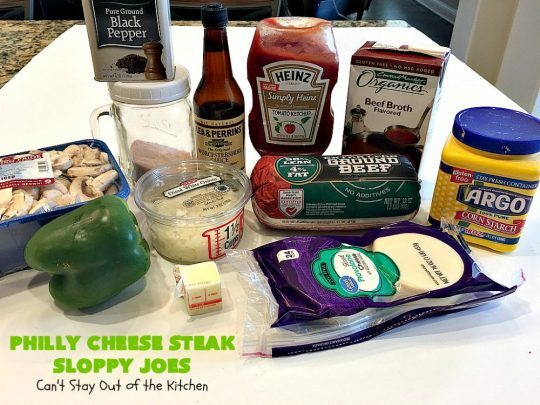 Philly Cheese Steak Sloppy Joes are awesome! 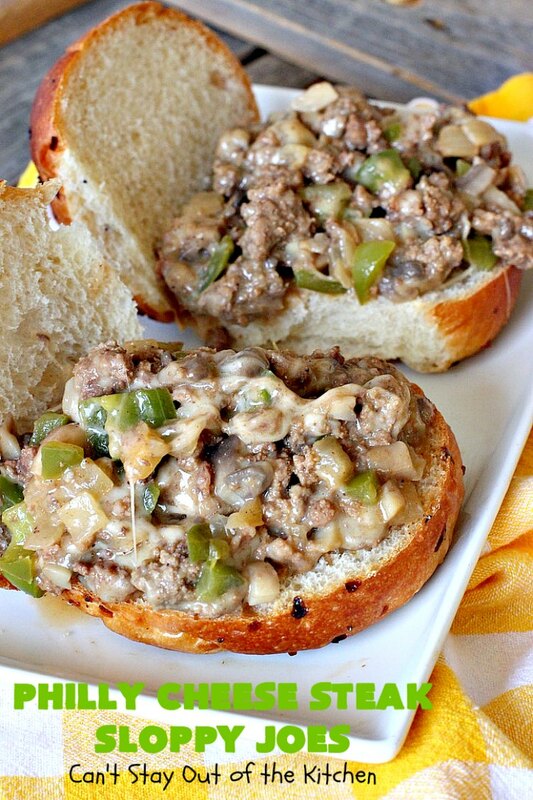 They're made with ground beef, bell peppers, mushrooms & loads of provolone cheese. This kid-friendly 15-minute meal is perfect for weeknight suppers when you're short on time. 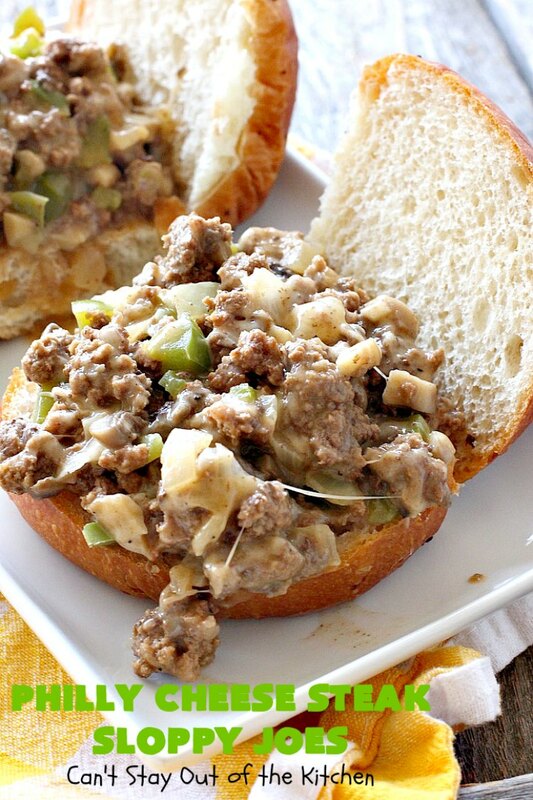 If you enjoy Philly Cheesesteak Subs, you'll love these Sloppy Joes. 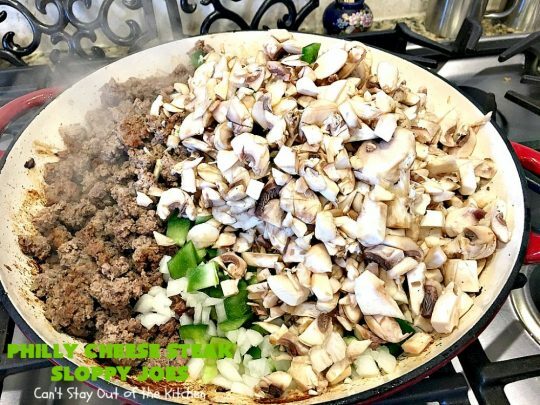 In a large skillet over medium heat add the ground beef. Brown the beef well on one side before turning over and browning the other side of beef. With a slotted spoon, remove the beef, leaving the grease in the skillet. Add butter, onions, bell peppers and mushrooms. Let veggies brown 1-2 minutes before stirring. Continue cooking an additional 1-2 minutes. 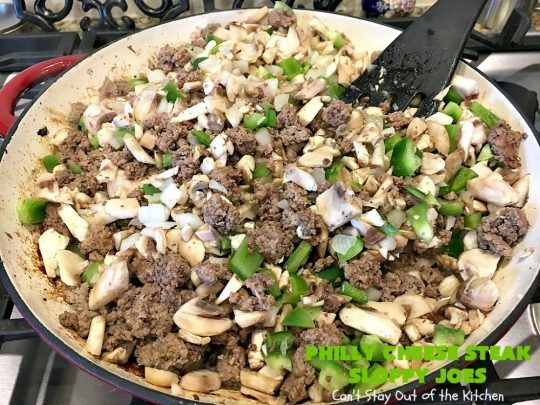 Stir the beef into the skillet. In a small bowl, combine the beef broth and cornstarch. Add ketchup, Worcestershire sauce, salt and black pepper and whisk together. Pour beef broth mixture into the skillet. Cook until the liquid is reduced somewhat, about 3-5 minutes. Turn off the heat, stir in provolone cheese pieces. Serve on toasted brioche buns. NOTE: While I left the beef in the skillet, it would be easier to remove it before sauteing the veggies. The veggies will also cook faster this way. Recipe adapted from Dinner Then Dessert. 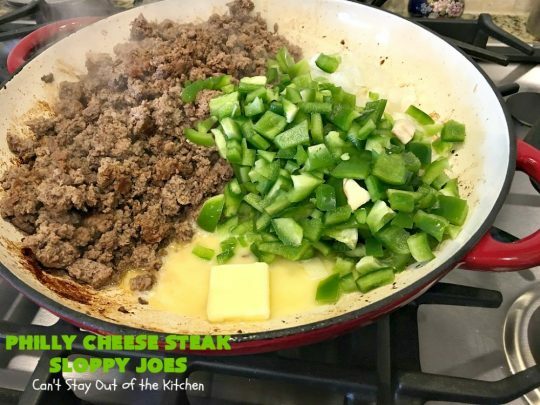 Philly Cheese Steak Sloppy Joes are awesome! Philly Cheese Steak Sloppy Joes are terrific to make for holidays like Memorial Day and Labor Day. 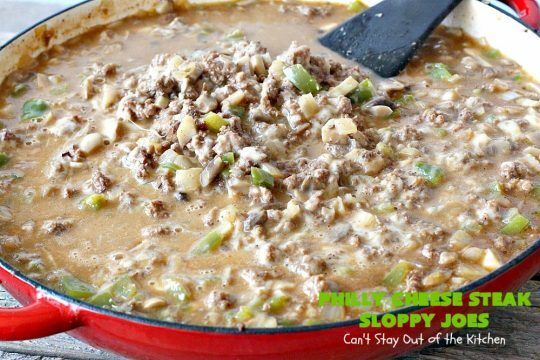 If you enjoy Sloppy Joes, this is a version you can’t be without! I found a similar recipe on Pinterest for this and made it the other day — it’s absolutely delicious! I love traditional Sloppy Joe’s, so when I came across this recipe, I knew I would love it, too. Who doesn’t love provolone cheese?! It’s a win-win. My husband, who is pretty picky, even went on about how amazing it tasted. This will definitely be a permanent staple in our dinner rotation! Thanks, Sara. It really is delicious and so very easy to prepare. So glad you like the recipe.